Hi, I`m Luigi! I was at the Santa Cruz shelter, and Mickaboo kindly gave me a place to land. I`m a very pretty boy, aren`t I. I`m kinda scared right now, so I`m not too animated in my new home. But I am slowly feeling safe in my new cage in my new foster home. Today I even felt safe enough to preen myself while my new foster family was nearby. I`m a seed eater and I do my best to ignore the pellets mixed into my food dish! I see these funny green things my foster parent says are called "vegetables;" she clips them to the side of my cage but I stay away from those scary things. There are also big colorful things attached all over the cage, and hanging from the top, she calls those "toys" but I just ignore them. Don`t you think I`d be an awesome addition to YOUR forever flock? 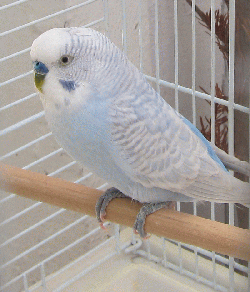 He does call /return call to the budgies in the other room, but not urgently and not all the time. His chirp is funny sounding, sorta rough/not clear.